The Ferdinand Blumentritt Light Railway Transit Station is located between Abad Santos station and Tayuman LRT station. 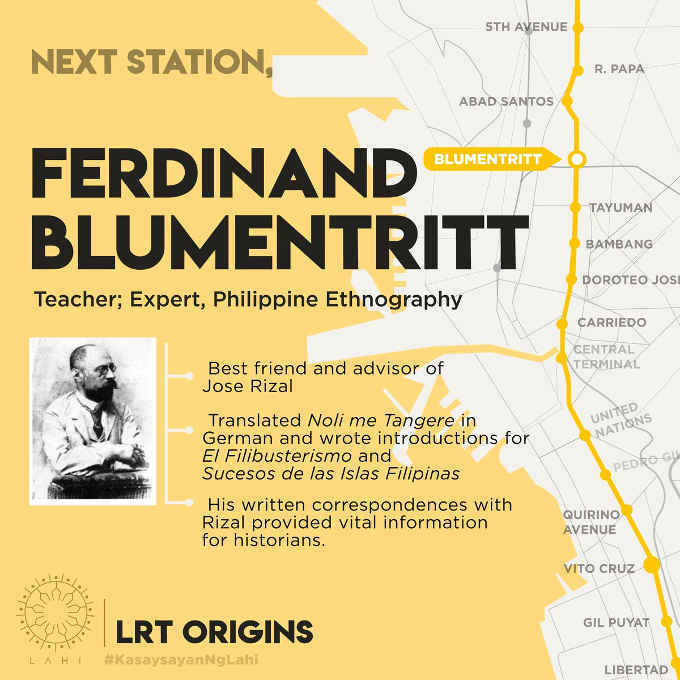 Blumentritt station was named after Ferdinand Blumentritt. He is a teacher. Blumetritt is a friend and advisor of Jose Rizal, Philippines’ national hero. He translated Jose Rizal’s Noli Me Tangere in German and wrote introductions for El Filibusterismo and Sucesos de las Islas Filipinas. Presently, bottled water and other liquids are not allowed in LRT stations because LRT management would not risk the safety of its passengers and exert all efforts to avoid a repeat of the Rizal Day bombing 18 years ago.